Oh I love this post…the photo is wonderful and begs so many questions….and the words are full of wisdom. So the question is, did you PUT the chair there, or was it left by some anonymous donor?! Great choice! Thank you much for the ping-back! Wonderful photo! For me, it definitely makes a statement about the passing of time. I also find the contrast of the color palette appealing. Earl, thank you much! yes, it’s an interesting chair can’t help wondering what stories it holds. The passing of time and still there is such dignity about it… It was a beautiful evening the way only frost and winter can bring out the colors and contrasts. Good shot, Hanne! I like the contrast. I hope words will choose you soon 🙂 have a nice sunday! Take care, F.
This made me smile. What a great image; what a great pairing of image and words. The way one of the chair’s legs is off the ground makes it seem animate, as if it is hopping from one leg to another, thinking about making a dash into the sea. Or perhaps it seats an invisible presence (who if we could only see him or her would be as nobly dishevelled as the chair), leaning back a little and to the left to take in everything that can be seen – everything you convey in this wonderful photograph. I’m so happy it made you smile. 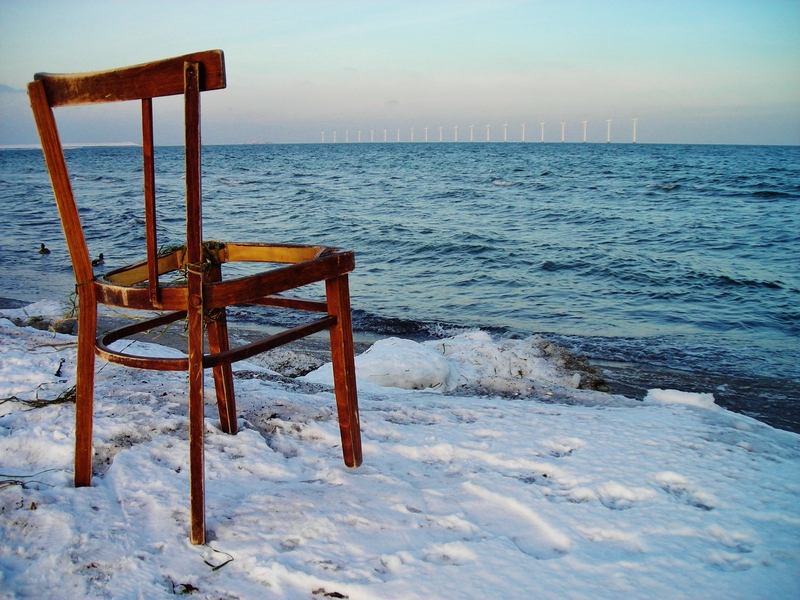 It made me smile too, when I saw the chair just sitting there, as if it had just popped out of the blue and landed, even surprising for itself, on a cold winter beach. Perhaps you are right, it came with an invisible presence. I truly love that image of it. Thank you so much for letting me see this photo with new and deeper and even more smiling eyes.